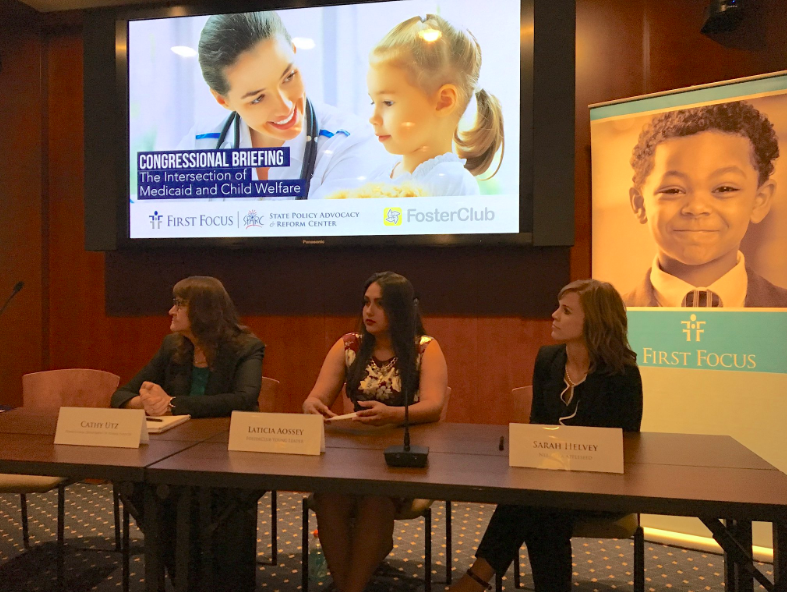 FosterClub Young Leaders, Laticia Aossey and Christina Andino, participated in a Congressional Briefing on the Intersection of Medicaid and Foster Care sponsored by First Focus, FosterClub, and Congressman Tom Marino and Congresswoman Karen Bass of the Caucus on Foster Care. Congresswoman Bass shared the importance of fixing the glitch or #FixTheGlitch in the current Medicaid to age 26 provision of the Affordable Care Act (ACA). Bass’s H.B. 4998 passed the house and is now part of a bipartisan Opioid Package (H.R.6) in the Senate. Cathy Utz, Deputy Secretary for Children at Youth and Families, Pennsylvania Department of Human Services, and Sarah Helvey, Child Welfare Program Director at Nebraska Appleseed, shared statistics demonstrating the direct impact of Opioid addiction on foster youth, and the subsequent need for health care. They also shared both noteworthy practices and the struggles stakeholders face as they implement the provision on a state level. Laticia and Christina put a face to the policy and implementation issues. Laticia shared that after completing her BA, her plans for Grad school were impacted by the glitch. Christina shared about the lack of available information about her benefits during her transition out of care and the importance of getting the word out to former foster youth.